This recipe was introduced to me a few of years ago as Friendship Pie, a recipe that gives you two pies — one for you and one for a friend. However, it also goes by more descriptive names including Coconut Pecan Pie, Pecan Delight Pie and Caramel Drizzle Pie. I like the name Friendship Pie, so I’ll stick that! 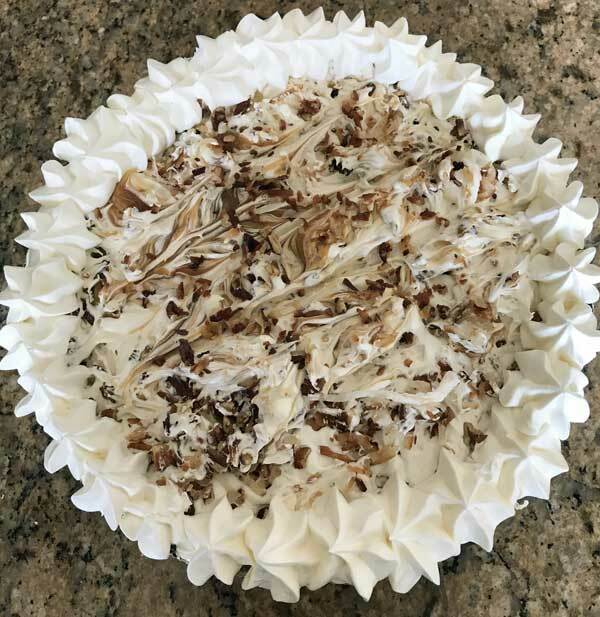 It’s made with butter-toasted coconut and pecans, caramel sauce, cream cheese and whipped topping. And what I really like about it is you can use all convenience products and still have a great pie, or you can take various elements and make them from scratch. For instance, you might want to make your own sweetened whipped cream or homemade caramel sauce. If you’re in the mood to make the crust from scratch, you can do that, but for this pie store bought pastry and graham crusts work well. If you end up using the graham crusts, you’ll have to really pile in the filling because they are not quite as deep, whereas the frozen deep dish pastry crusts such as Pillsbury and Marie Callendar hold a little more filling. So next time you have to throw together a couple of easy pies, this is a good one. And if you only want to throw together one easy pie, the recipe halves well. The remaining half can of condensed milk for a small batch of Magic Bar Cookies (Hello Dollies). Coconut Pecan Caramel Friendship Pie gives you two pies, one for yourself and another for a friend. If you don't have friends you can halve the recipe. Prepare the pie crusts by baking as directed. If using graham cracker, brush the crusts lightly with beaten egg and bake on cookie sheet at 375 for exactly 5 minutes. In a large skillet, melt the butter. 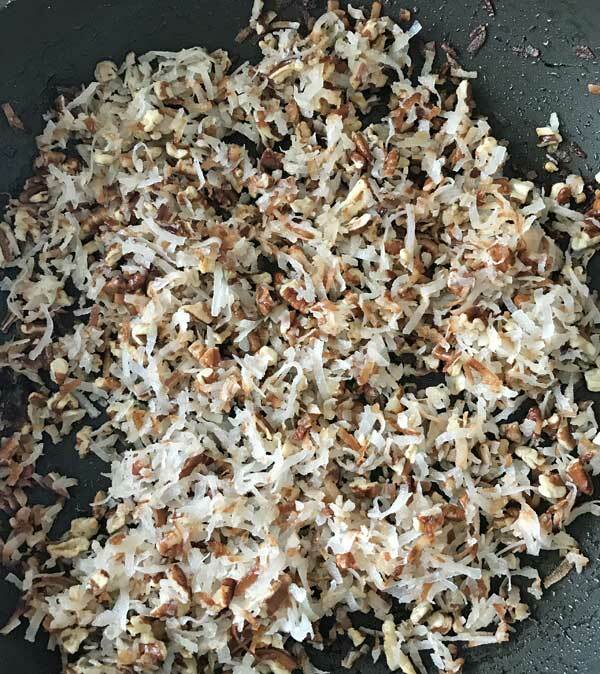 Add the coconut and pecans and stir the mixture until fragrant and coconut starts to brown around the edges. Remove from heat and let cool completely. In a large mixing bowl, beat the softened cream cheese and sweetened condensed milk until smooth; fold in the whipped topping. 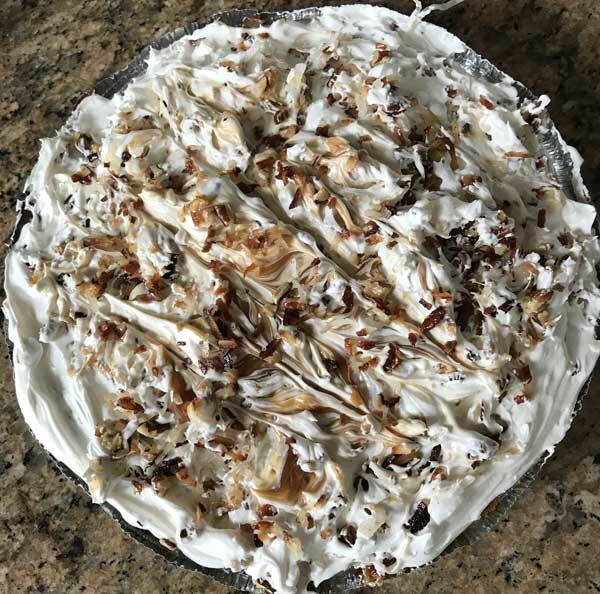 Layer about a third of the cream cheese mixture in each pastry shell, drizzle with a third of the caramel topping, then sprinkle on a third of the coconut mixture. Repeat until you’ve used all the filling. Also, if your caramel sauce is thicker, you may need to spoon it and drag it rather than drizzle. If desired, pipe extra whipped topping around the sides. Angie, thanks for trying it!! Easy to make and it quickly disappeared…thank you. Wow, this sounds really good!! !